DP4+, Multi-Effects Processor from Ensoniq. 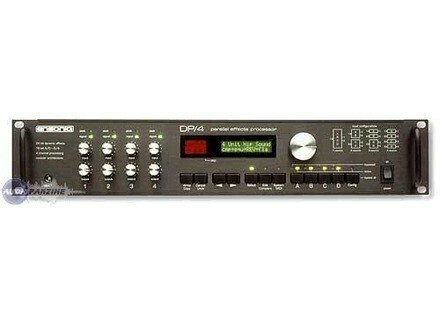 A digital multi-effects rack, 4 24-bit processors with reliable feedback, input gain that enables a pure saturation. 4 inputs / outputs, ability to process 4 signals in parallel with a DSP signal. 1 MIDI input, 1 HP, 1 x stereo footswitch .... ask me about this last point, I do not use it. The model is built, a possible failure on the internal battery, which requires manipulation simple enough to change it. The transformer of the animal makes noise as it is unpleasant when it is laid aside. Not too much editing as possible other than by HEAVY interface. MIDIQuest can normally handle this via MIDI, but it is slow, subject to many plants, and all possibilities are not working. Cool one point, the manual is really screwed. The effects are numerous, and certainly not realistic. We are in a much more direct mail and an imitation of natural sound. We must know before buying a DP4 is a super grain, for there is no cons in mastering tool clean. Very good effects to put behind a synth, samples and do not overlook a small passage on the drums which can give a good punch. only problem: certainnes effect combinations generate background noise. I've had it for over a year, I am very happy and I use it more. Very good value for money, it has not yet been soaring on the old stuff but given the reaction of those who play with, I think it will come soon enough.